The Gavia Pass (2651 m) - one of the highest mountain passes in Europe - connects the provinces of Sondrio and Brescia. From Bormio and Santa Caterina head towards Ponte di Legno crossing the beautiful pastures and woodland of the Stelvio National Park. Interestingly the Gavia Pass is the only place in Italy where you can find specific characteristics of the Arctic tundra, i.e. what’s left of the last glacial period. The pass can be accessed from late spring to late autumn. Motorcyclists and cycling enthusiasts from across Europe choose this route every year not only for its morphological characteristics and landscape, but also because there is relatively little traffic. 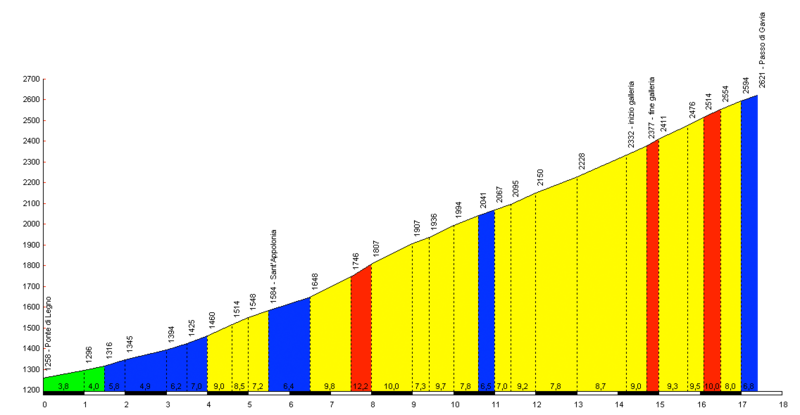 It is a very challenging route: with a vertical drop of 1044 m and an average gradient of 7% (up to 16%). The route is characterized by panoramic bends and is completely paved, although in a few areas the paving can be a bit uneven. Pay attention because sometimes the road becomes quite narrow. 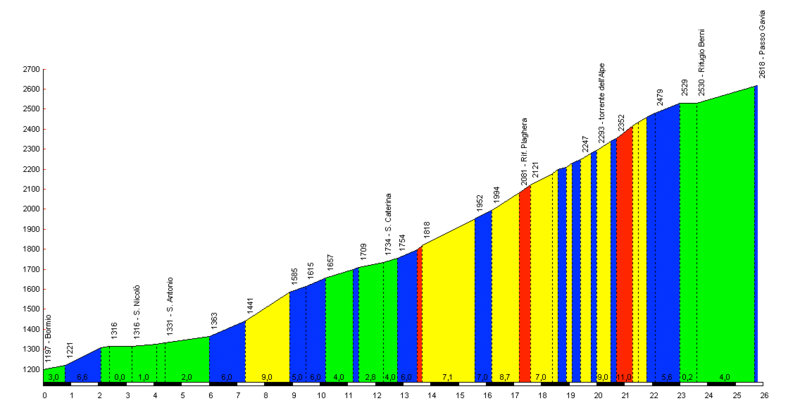 The Gavia pass has been Cima Coppi 7 times and its opening usually coincides with the transit of the Giro d’Italia. A particularly challenging 26km route starting at 1225 m and finishing at 2621 m above sea level. A very challenging 17km route from 1258 m to 2621 m above sea level.